Liuzhou is situated almost on the border of the Cantonese speaking south and standard Chinese (Mandarin) speaking north of Guangxi. In addition there is a high number of Zhuang (壮语 zhuàng yǔ) speakers and Liuzhou has a dialect all of its own! This means that, as you wander about town, you can hear at least four different languages being spoken. Add on a smattering of Dong, Yao and Miao speakers and you realise you are in a linguistic nightmare! Fortunately, most people understand Mandarin (普通话 pǔ tōng huà)) even if they do not speak it well themselves. Most local teachers are required to sit putonghua exams - many fail! Liuzhouhua (柳州话 liǔ zhōu huà, the local dialect; technically '桂柳话 guì liǔ huà') is based on standard Chinese, but has also been influenced by Zhuang. Some differences are immediately noticeable. The soft /j/ sound in putonghua becomes a hard /g/ so, for example chicken changes from ji (pronounced 'jee' as in 'jeep' to 'gee' as in 'geek'). Zhuang is a totally different language, unrelated to Chinese. It is a member of the same language family as Thai, but, as the Zhuang have been largely integrated with the Han Chinese for centuries, a certain amount of assimilation has taken place. To confuse matters further, Zhuang has several dialects. In Guangxi, most public buildings have signs (see above) in Chinese and in Zhuang, which is written using a modified Roman alphabet. No! It's not pinyin gone mad! Zhuang is also one of the five minority languages printed on every Chinese bank note. 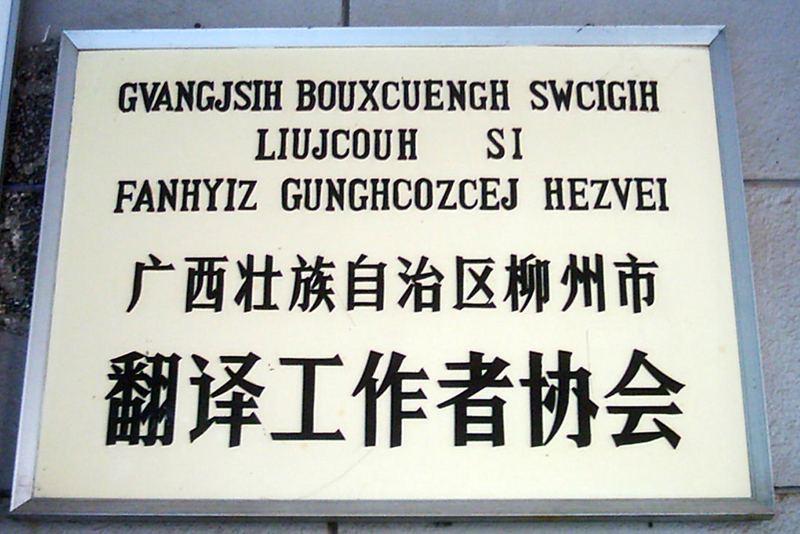 The sign above translates as "Guangxi Zhuang Autonomous Region, Liuzhou City Translators Association"
For more information on Chinese languages in general, click here..